Ethiopia’s Productive Safety Net Programme (PSNP), set up in 2005, aims to make fully food secure the millions of people still dependent on food aid, provide support to the vulnerable to prevent the depletion of livestock, and create productive assets at community level. But nearly a decade on and over US$3 billion spent, how successful has it been? PSNP claims to be a programme that bridges the response gap between emergency relief and long-term development aid, and helps build resilience. Initially, it was available in four regions – Tigray, Amhara, Oromiya, and the Southern Nations and Nationalities’ Peoples’ Region – and was later extended to the more remote regions of Afar (in 2006) and the Somali Region (2007), according to the World Bank, one of its main backers. The Ethiopian government spends 1.1 percent of GDP on PSNP and a complementary scheme called the Household Asset Building Program (HABP). Both schemes are largely donor funded. The current phase of PSNP (2010-2014) which includes HABP, costs more than $2 billion. Donors include the World Bank, International Development Association (IDA), the US Agency for International Development (USAID), Danish International Development Assistance (DANIDA), UK Department for International Development (DFID), European Commission, the Swedish International Development Cooperation Agency (SIDA), the governments of Canada, Ireland, Netherlands and the World Food Programme and the UN Children’s Fund (UNICEF). 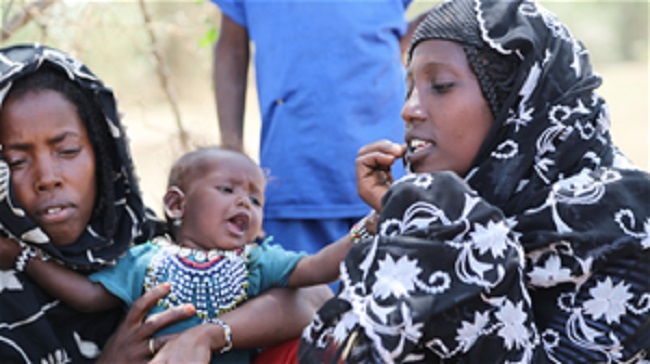 PSNP provides transfers – cash or food – to between six and eight million chronically food insecure Ethiopians for six months each year, according to DFID. At least 85 percent of the beneficiaries receive cash transfers as wages for labour on small-scale public works projects. These projects are selected by the community and contribute to environmental rehabilitation and local economic development, while 15 percent are “direct support” beneficiaries (disabled, elderly, pregnant or lactating women) who receive unconditional transfers. Both donors and the government have become increasingly aware that PSNP does not really help secure those who have very limited or no assets against shocks, and help them “graduate” from a chronic situation to a state of food security. Hence HABP was introduced in 2010 to help people build their livelihoods and create assets. Credit, agricultural extension and microenterprise advice, and linkages to markets, are part of the support provided. “These initiatives help households build their asset base, diversify their livelihoods and achieve food security, so ‘graduating’ from PSNP,” according to DFID. HABP has so far provided technical advice on how to improve livelihoods to 1,059,044 households; of these, 812,655 have prepared business plans. The government says about 495,995 households “graduated” from PSNP between 2008 and 2012 out of more than seven million beneficiaries (till 2012), a figure some Ethiopian officials acknowledge as low. A household has “graduated” when, in the absence of receiving PSNP transfers, it can meet its food needs for 12 months of the year and is able to withstand modest shocks. According to the most recent emergency food aid data s largest number of beneficiaries were in Ethiopia (more than five million). A recent study by Oxford University ranked Ethiopia the second poorest country in the world after Niger. Duba Oundanumo, chief of Anderkelo kebele (municipal ward) in the arid Afar region, a northeastern pastoral community frequently dependent on food assistance, does not think PSNP will help local people emerge from chronic poverty and food insecurity any time soon. “It is very hard for these families to become food secure. They are too poor… When you have nothing – no animals [no assets] – it is very difficult to recover from shocks [like droughts],” he said. The community has created a protected pastureland in exchange for food from WFP, one of the implementing partners of PSNP. PSNP is being implemented in places as remote as Sebana-Demale, a village just 60km from the Danakil depression in the Afar Region, one of the hottest places on earth, with temperatures of 40 degrees Celsius or more all year round. The village is only accessible during the dry months. Government insiders say the current focus is on ensuring PSNP is accessible across the Afar and Somali regions; HABP will come later. Over the decades, drought and the inability to produce enough food have pushed millions of Ethiopians into hunger. The World Bank says agriculture accounts for 45 percent of Ethiopia’s GDP, while providing a source of income to 80-85 percent of its population. “Any small variation in rainfall or world prices (for coffee) affects the incomes of 30 to 40 million people and can mean hunger for 10 to 15 million people,” says the Bank. “Both predictable (chronic) and unpredictable (acute or transitory) needs have largely been met through emergency relief [in Ethiopia],” says the Bank. While aid has saved millions of lives over the decades, it has failed to protect livelihoods and assets. “The unpredictable timing and level of relief resources flowing through the emergency channel means there are few opportunities to do more than address humanitarian needs,” it adds. Meanwhile, the debate continues within aid circles on how to determine if a household is indeed “food secure”, as some households who were seen to have “graduated” have sunk back into poverty after a few shocks. IRIN did not come across anyone who had “graduated” in the villages it visited in Afar. HABP, which could give people a better chance of “graduating” is not available everywhere yet. Getting “people to work in Afar [and Somali Region] under PSNP is a big achievement on its own,” reckons an aid worker who preferred anonymity, referring to Afar’s notoriety as “Ethiopia’s Wild West”, where AK-47 wielding pastoralists would rather face a dispute over a livestock theft allegation than do actual physical labour such as planting trees and lifting boulders to shape the course of a river. “The implementation of the PSNP in Afar and Somali regions of Ethiopia is ambitious,” said John Hoddinott, a senior research fellow at the International Food Policy Research Institute (IFPRI), who led the most recent impact evaluation of PSNP and HABP for the World Bank in 2012. “While high levels of chronic food insecurity are indicative of the need for a safety net intervention, poor infrastructure and widely dispersed populations make implementation challenging. While there is some evidence of programme success in reducing food insecurity, we are likely to see additional efforts aimed at strengthening programme performance in 2014 and beyond,” he added. The evaluation – a collaborative effort between IFPRI, Institute for Development Studies and Dadimos Consulting in Ethiopia – says: “PSNP has significantly improved food security in all regions between 2010 and 2012. While there remain differences in food security across regions, these differences are narrowing. Food security improved for both male and female headed households…” It has also rehabilitated the environment and natural resources, and improved access to education and health care. The evaluation said that in 2010, PSNP and HABP together increased food security 2.5 times more than PSNP alone. “In the highlands, the PSNP is well targeted. Beneficiaries are poorer and more food insecure than non-beneficiaries,” says the evaluation. But it goes on to note that PSNP is “poorly targeted in Afar and Somali”, and that in some areas “beneficiaries are selected by kebele or clan leaders without input from the wider community.” Further, the identification of deserving candidates has been marred by sporadic allegations of political influence in drawing up the list of PSNP beneficiaries, though past evaluations have shown that this is not systemic. DFID’s 2014 review said political influence was “scattered and localized” and that it could be countered by strengthening a kebele-level appeal process for deserving people left out of the list, and by conducting roving audits. People are also unhappy with the 15kg of cereal handed out by WFP as monthly payment for public works under PSNP. “We need something more – some oil, beans perhaps,” said Amina Aliyou, a resident of Sebana-Demale. However, WFP’s head of programmes Hakan Tongul said the amount is set: “It is not supposed to cover the food needs of the family” and should rather be viewed strictly as “payment for public works”. Another way to cut dependency on foreign food aid, which is already happening in Ethiopia, is to purchase food from local surplus areas, he added. DFID envisages a gradual shift from food to cash transfers, which puts more disposable income in the hands of the people, allowing them to build up assets. Food currently accounts for over 40 percent of total PSNP resources. More tinkering with the programme is likely in its 2015-2020 phase, said DFID. “At the end of the day, what PSNP has achieved so far is an example to other developing countries of what political will can do. The Ethiopian government is really committed to making this work, and will do anything to get its people off food aid for good,” said an aid worker who preferred anonymity.